Stand apart from all the rest with this ONE OF A KIND vase designed and made by me. This also would be a sweet unique gift for a hostess gift, Mother's Day gift, etc. Imagine your beautiful flower arrangements for your special event in these vases. These are unique and made all by me. You will not find these anywhere else. I have thoughtfully designed and hand created each one. 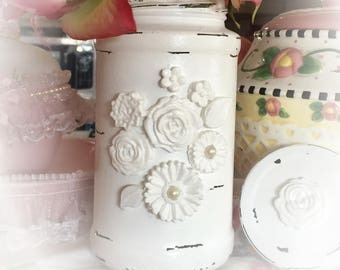 They have been distressed/chippy painted it for that shabby chic charm appearance and added floral cabochon style embellishments which are ALL HANDMADE and hand painted by me, the lid is included as well which is topped off with a handmade rose cabochon embellishment. 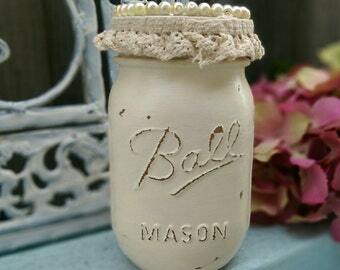 The flower embellishments will be the same color as the jar. These can be used for your wedding, bridal or baby shower table centerpieces, birthday or anniversary party, reunions, etc. 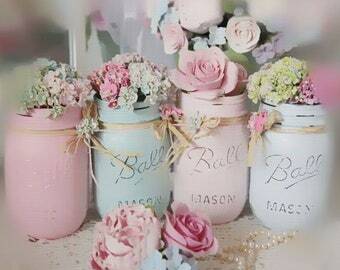 Add instant shabby chic charm to any table or shelf in your home. Can be set alone with no flowers since it's so decorative as it is. Measurements: Approximately 5.75" high. The mouth opening is 2.25" diameter. These might vary a tiny bit depending on my stock. If you are ordering more than one, they may vary in sizes and style just a tad (again depending on my stock).